As summer heats up, spread your wings and celebrate with the funniest birds in town! 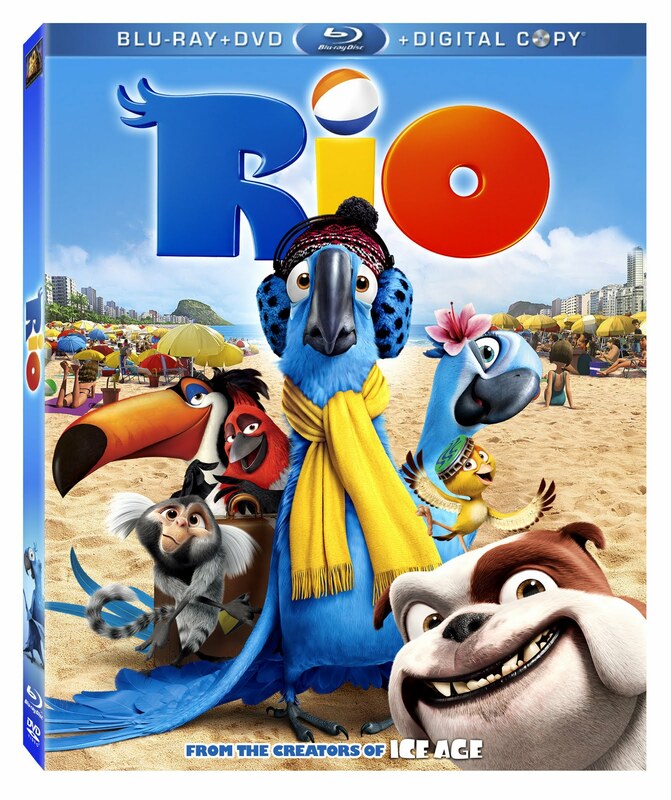 The all-new comedy-adventure RIO comes to Blu-ray and DVD from Twentieth Century Fox Home Entertainment. RIO brings together vivid characters and colourful backdrops amidst energizing Latin and contemporary tunes, creating the ultimate family-friendly music and dance experience for audiences of all ages. In addition to more than one hour of special bonus features and materials, consumers will have access to all-new exclusive levels of the smash video game hit Angry Birds Rio® that showcase your favorite characters from the film! Captured as a young bird from the wild, Blu (Jesse Eisenberg, The Social Network) is a domesticated Spix Macaw living thousands of miles away from his homeland, Brazil. When his human owner Linda (Leslie Mann, 17 Again) discovers that he is the last male of his kind, they head south to Rio de Janeiro to meet the only other female. But it’s far from love at first sight between the socially-awkward, flight-challenged Blu and the fiercely independent, high-flying female, Jewel (Anne Hathaway, The Princess Diaries). Shortly after Blu’s arrival, the two rare birds are captured by greedy animal smugglers and find themselves lost in the Brazilian rainforest. Unexpectedly thrown together, they embark on a hilarious and clumsy adventure where they learn about friendship, love, courage and spreading one’s wings to fly. The creators of ICE AGE bring audiences a whole new tropical adventure in RIO featuring the most colorful cast of characters south of the Equator, including George Lopez (Beverly Hills Chihuahua), Tracy Morgan (“30 Rock”), Jemaine Clement (Despicable Me), Rodrigo Santoro (Che), will.i.am (Madagascar: Escape 2 Africa), Jamie Foxx (Dreamgirls), Jane Lynch (“Glee”), and Wanda Sykes (Over The Hedge). Olivia (age 4) - I like the part where Jewel flies and sings. I don't like the part where the don't kiss. But I like the part where they kiss. Owen (age 7) - awesome, awesome, awesome, awesome! Aiden (age 9) - I like it because I think it was the best movie I ever saw and it was pretty cool and my favourite character is the chicken dude with the bottle cap for a hat. I like it. This animated movie is delightful! The music and effects are of superior quality, and the colours are particularly clear and pleasing. The viewer is challenged by the cruelty to two wonderful birds who have been stolen from their native jungle, chained together, caged and sold to a pet store, where freedom is exchanged for money. The escape and ensuing adventures at Mardis Gras will keep young viewers riveted to the end. This is a story of love, loyalty, compassion and the pursuit of freedom. I highly recommend Rio to children of all ages. I was sent a free copy of this movie to review.